In 1974, Chinese farmers were digging a well when they encountered a life-sized soldier made of clay. Confused and intrigued, they reported their findings to the government who promptly sent scientists to the Xian site to begin further excavations. Unbeknownst to the farmers, this solitary figure was part of an entire army of life-size soldiers, horses and chariots. This remarkable discovery is still considered one of the biggest in archeological history. 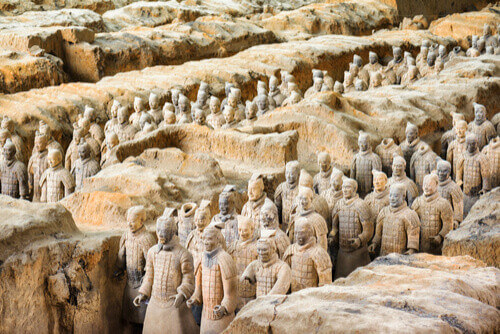 Historians believe the Terracotta Army was built as part of an opulent mausoleum for the first Emperor of the Qin dynasty and the man credited for uniting China, Qin Shi Huang. 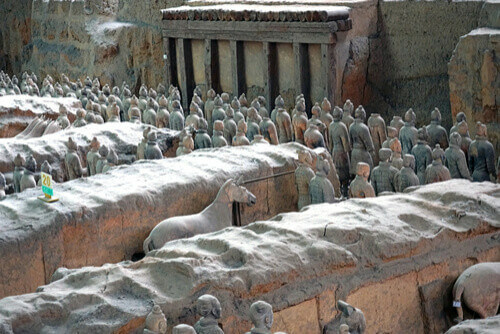 It’s thought that the army was constructed to guard the tomb of Emperor Qin in the afterlife and to ensure he would have the same imperial status and power in death that he enjoyed during life. It’s estimated that the tomb took almost forty years and 700,000 people to construct. Although the site is open to the public, it's important to note that it is an active dig site; archaeologists believe there are an additional 6,000 figures yet to be uncovered. Upon entering the Terracotta Warriors Museum, you’ll watch a short movie explaining their significance and how the army was first uncovered, before proceeding to the open pits to view the clay statues. The rows and rows of warriors are a phenomenal sight to behold, especially when you consider that each figure was created by hand without the use of tools. 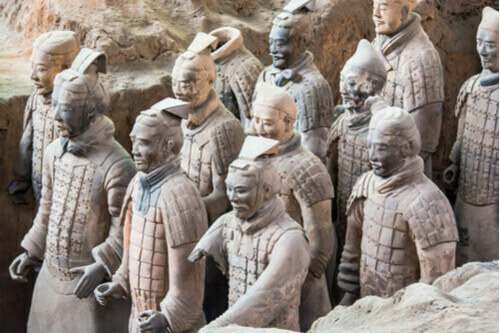 Take a closer look and you’ll notice that no two soldiers are alike - each terracotta figure has been moulded with intricate details like facial expressions, hairstyles, and gestures. This, in addition to their organisation by military rank, suggests that the figures were modelled after real people. In addition to the nearly 2,000 soldiers, archaeologists discovered chariots, cavalry and weapons, which are also on display across the three pits. 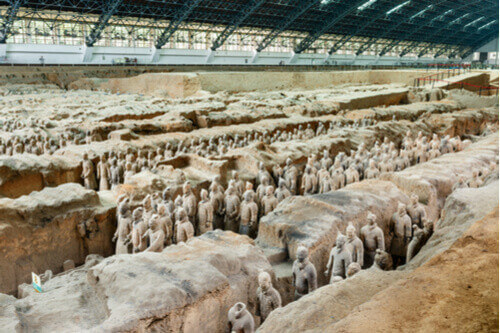 While the warriors are a significant component of First Emperor Qin’s mausoleum, they’re merely one part of his enormous necropolis. Interestingly, his actual tomb has never been opened. Although advances in science have reduced the risks involved with ancient excavation, experts believe the chances of damaging such an important part of Chinese history are still too high. For now, less invasive techniques such as remote sensing and radar are being used to deduce information about what lies inside. Results of these tests have shown the complex to be almost 100 sq km and contain interconnecting caverns. Information about the suspected contents of Emperor Qin’s tomb are exhibited inside the museum to read at your leisure.